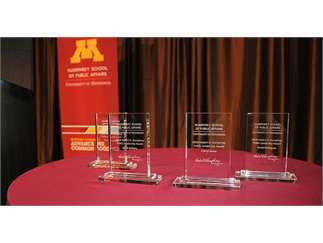 The Humphrey School of Public Affairs is recognizing national civil rights and women's advocate Johnnetta Betsch Cole, longtime Minnesota Public Radio host Gary Eichten, and Minnesota Air National Guard Brigadier General Sandy Best for their commitment to advancing the public good through equity and inclusion, with the 2019 Hubert H. Humphrey Public Leadership Award. Please join us for a formal dinner and program to celebrate their leadership and service. Tuesday, April 23: 5:30 p.m. Individual tickets on sale now. Proceeds support student scholarships.